ROCHESTER, NY – Semrock Inc., the leader in optical filters for biotech & analytical instrumentation, announced today that it has been awarded U.S. Patent No. 7,411,679 providing further coverage for its popular and game-changing BrightLine® series of hard-coated fluorescence filters. This new patent broadens the scope of previous patents pertaining to Semrock's highly multilayered thin-film "hard" coatings and robust one-piece construction – both hallmarks of its BrightLine filters. 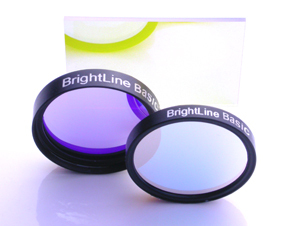 Covered features include superior image-registration performance, and a broader range of thin-film coating approaches to simultaneously achieve high transmission with deep and wide blocking for industry-leading brightness and contrast.